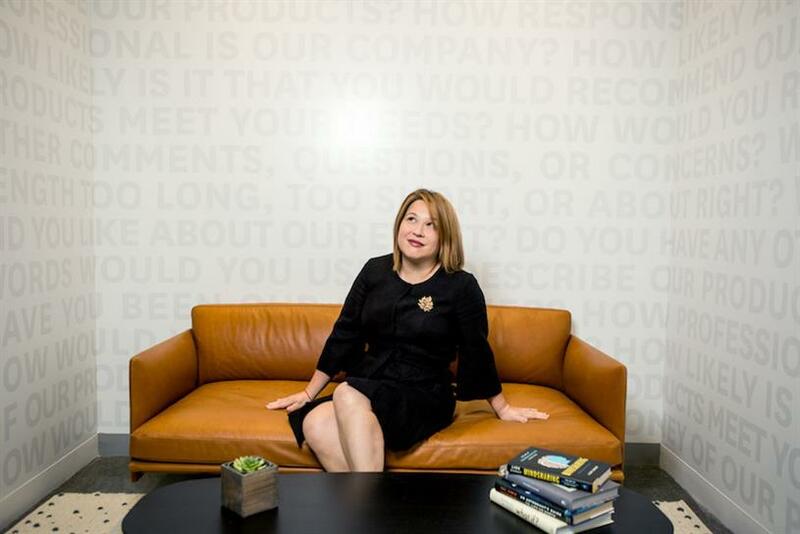 Survey Monkey SVP of Marketing Communications Bennett Porter explains how her company rebranded itself by looking beyond an artistic redesign. Why revisit a brand that is no. 1 in its field and already has strong brand equity? Because times change, businesses evolve and customers never stay still. While a recognizable logo has only a small impact on a company’s financial performance, a brand is a promise a company makes to its customers and an emotional connection that can drive a significant impact on revenue and profit performance. Nonetheless, even when this connection is strong, I’m a firm believer in revisiting brands and staying curious —EVERY business can benefit from curiosity. Turning to our own recent learnings, at SurveyMonkey, we have the good fortune to have a brand that is beloved by consumers and used by 99 percent of the Fortune 500 and millions of people each day. About a year ago, we embarked on a transformational brand journey that started with a survey. Why did we do it? To set a playbook for business change. A brand has a magnetic characteristic that can draw people together and galvanize them around a common mission. To define our company’s next stride, we wanted that magnetic pull that a clearly defined mission and purpose provides. We also wanted to signal change to the market, which is what most traditional brand excercises do. And finally, we spent time developing an employer brand to attract and retain talent. When you revisit your brand, leverage the opportunity. Do more than redesign a logo, develop a new messaging platform or ad campaign. Use the mandate as an opportunity to rally the company for growth. Revisit products, processes and procedures. Look at your operations through the lens of your brand and use it as a litmus test. What would you change? What would you do more of? What opportunities does the brand open for your company? We were able to open the aperture of our business and establish a broader definition of what we can own. That allowed us to develop new products that move beyond surveys and into a new category of people-powered data. Explore the opportunities your new brand exposes and seize the day. Start by being curious and asking questions. What do customers use your product for? You’d think it was obvious, but not always. Sometimes, assumptions get in the way. Unsurprisingly, we started our brand journey with a survey. Surprisingly, the results told us that people were using SurveyMonkey to unleash creative thinking, not as a survey tool. It was an a-HA! moment for us. We also found that curiosity was a key leadership trait and powerful business driver. These insights brought us to a new mission—"Power the Curious." To gain a competitive edge, any company needs to consistently ask questions so that they move beyond "what" is happening to start figuring out "why." In a world where brand marketing is traditionally done by a client and an agency, break down as many walls as possible to help gain internal support and foster creativity. We had representatives from finance, product, engineering, sales and customer and international operations involved in our brand steering committee. It made the cycles faster and collaboration stronger. The same goes for our agency/client relationships. With our creative agency partner, Eleven Inc., we set up an environment of co-creation, debate and discourse in order to surface the biggest, boldest ideas that are authentic to the brand and business. We leveraged the creative talents of the collective internal and external group to push the best ideas forward. Together with Eleven, we defined a process that cut through the traditional client-agency boundaries. This creative, agile approach to branding means that the strategic and design platform can be extended into every part of the business. Getting everyone involved also makes a major (and intimidating) cross-functional undertaking suddenly doable. While a brand exercise reaches beyond colors, design patterns and logos, it is energizing when you start making visual changes to the brand. Make sure that your colors, imagery, infographics and copy all ladder up to your main mission and design concept. In our case, we aimed to materialize and capture the essence curiosity in a modern brand that is ownable and unique to the distinct personality and mission of the organization. We also used the brand opportunity as a design thinking exercise to revisit product and content approaches. During every step of the design process, we asked ourselves: What does curiosity look, feel and even sound like? Everyone spent time paying attention to the smallest detail to bring curiosity to life. Fine craftsmanship always makes a difference—especially when it comes to branding. We launched the brand to our employees six months before our consumer launch. Around the same time, we started implementing programs to inject our mission to "Power the Curious" into our culture. We started to give awards to people who ask great questions. We invited speakers to talk about topics that employees were curious about. We leveraged our physical space to reflect our mission. We named conference rooms after curious places or things (Stonehenge, Hogwarts, Aurora Borealis), shared inspirational quotes about curiosity on walls and displayed factoid plaques around the office asking things like "Who drinks more espresso: Millennials or Gen X?" to spark employees’ curiosity. We even went so far as to change our new HQ address to "One Curiosity Way." You must bring the brand to life for employees first. Paint the picture and inspire greatness in them, because remember—change is hard. You need all employees to bring your new brand and mission to life. Bennett Porter is the SVP of Marketing Communications at SurveyMonkey.